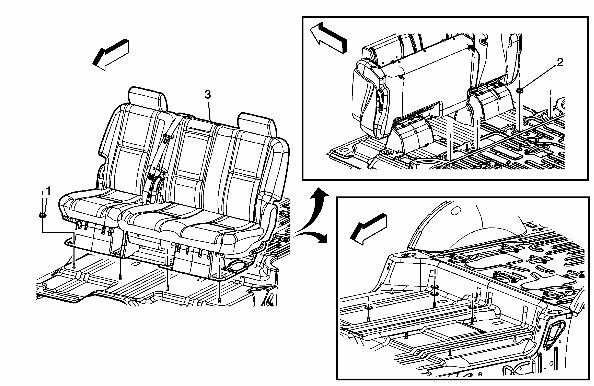 Technical Car Experts Answers everything you need: how to remove second row seats on GMC Yukon XL ? There are two types of seats basically, one is bucket type and other is 60-- 40 type seats. You flip the seat forward then remove the cover. Once you get that off you can take the 4 nuts off and lift the seats out. There are 4 nuts forward and 4 nuts rearward. 1. Disconnect the electrical connector, if equipped. 2. Remove the seat with the aid of an assistant; the seat is very heavy. 3. It is important that the washers stay in the correct locations for installation to ensure seat alignment. The rear inboard left side stud has one washer. The rear inboard right side stud has two washers. The front inboard right side stud has one washer. • The rear inboard left side stud has one washer. • The rear inboard right side stud has two washers. • The front inboard right side stud has one washer.